I can hardly believe it, but this simple, decadent, rustic, marzipan-inspired little almond butter cake has been hanging out in a folder on my computer somewhere for over a year now ? I plain forgot to put it on the blog. Whoops. ? 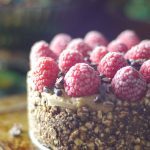 I made this little cake as a cashew-free alternative, since so many of you ask for that in the raw desserts. So here you go — an almond-based treat alternative. It was made in the height of my obsession with the most delicious, creamy, and smooth almond butter ever. 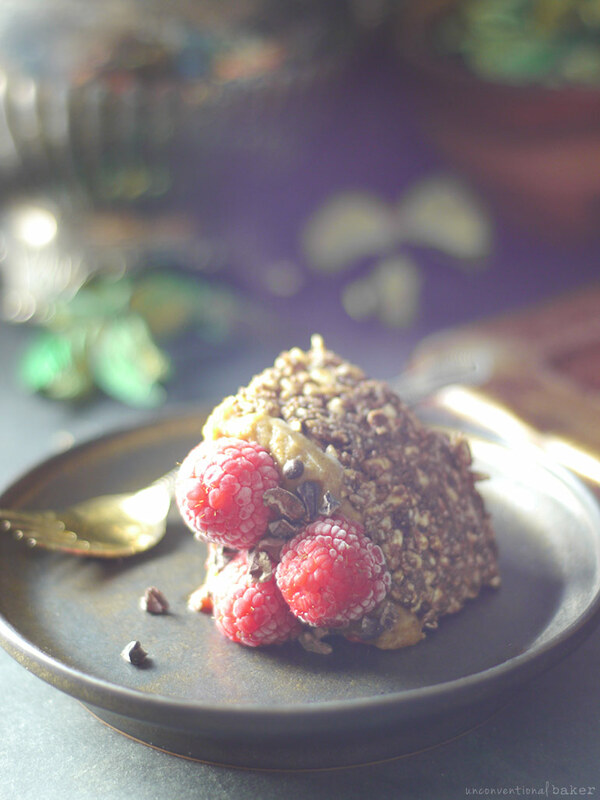 Coupled with a bit of almond extract and raspberries (though just with chocolate would be amazing too) –> ✨ This near-raw beauty is fudgey, almost caramel-like, and tastes like marzipan. Bonus points: this recipe is great for those that don’t have a power blender or a blender powerful enough to get raw nuts into the smooth consistency generally needed for raw treats. Quick note: I put coconut oil in the ingredients because I liked it better with it in terms of consistency/ease of working, but I’d say it’s highly optional if you prefer to go coconut-free or oil-free here. 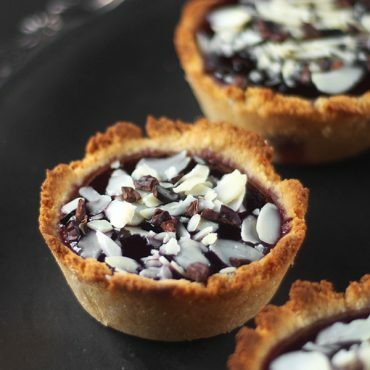 You can add a bit of plant milk instead to the filling and be good to go. Just beware it’ll be slightly meltier, read: eat straight away (but why wait anyhow, when you’ve got a cake like this on your plate, right?! ?). I made this in my tiny 5″ springform pan. To adjust to other pan sizes, see downloadable cake conversion chart below. You can also make it in a smaller size in muffin cups (just make sure to use a strip of parchment underneath so you can pull them out easily), or any lined small dish of your choice. 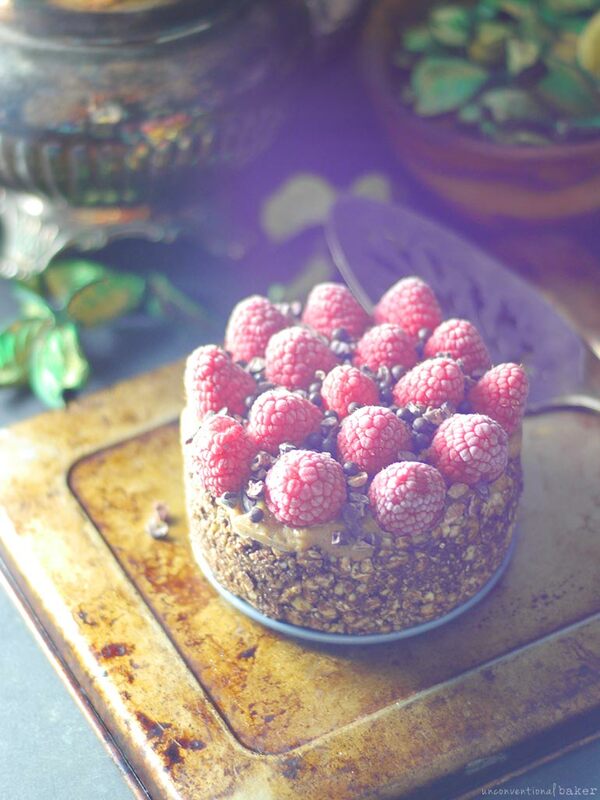 A simple, decadent marzipan inspired almond cake topped with fresh raspberries. 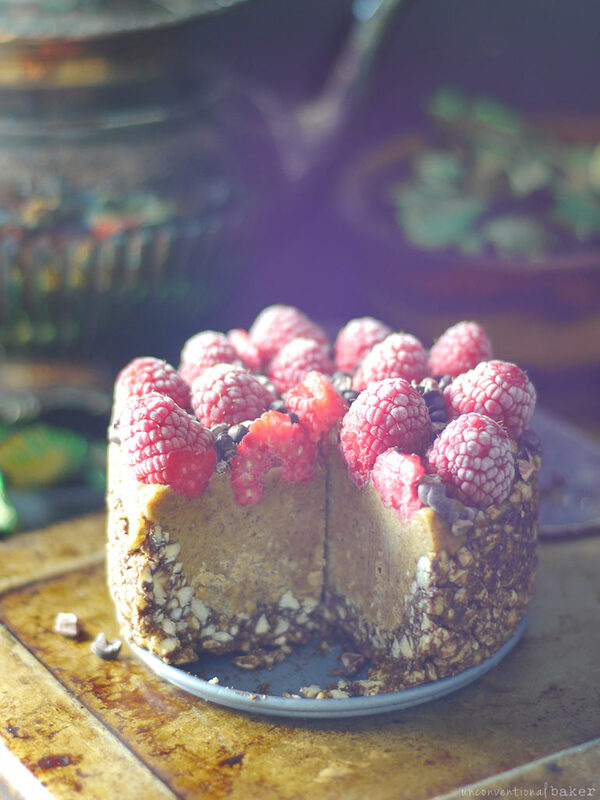 Raw vegan cake made without cashews. 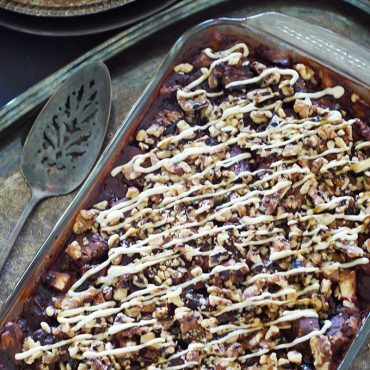 Rich, rustic, and fudgey. Gluten-free. Process all crust ingredients into a fine sticky crumble in a food processor. Transfer into a 5″ springform pan and press into a crust with your fingers, covering the base and wall edges all the way to the top (I made the wall edges thinner and the base thicker). Freeze while working on next step. Blend all filling ingredients in a blender into a smooth consistency. Transfer into the cake pan over the prepared crust and smooth out the top with a spoon. 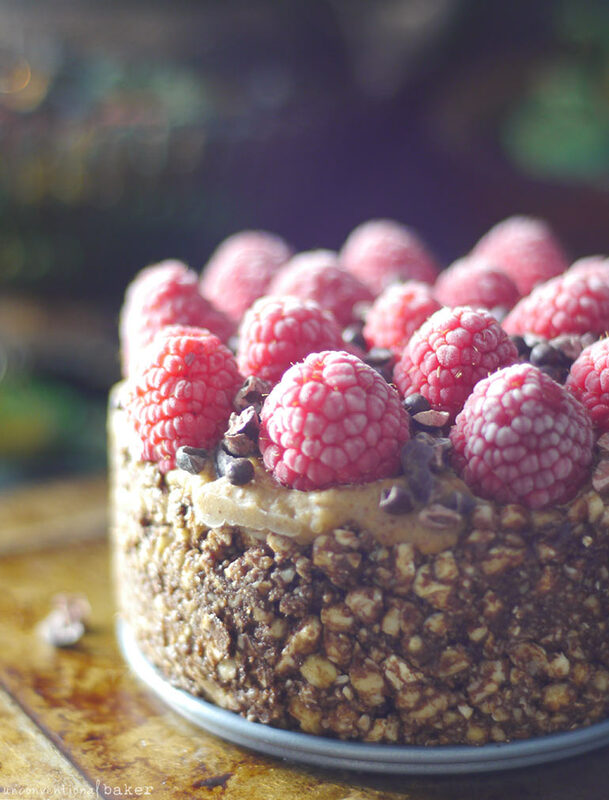 Top with raspberries or other toppings. Freeze for 5 hours or overnight. Thaw out a few minutes prior to serving and enjoy! Keep leftovers frozen. Note: this post contains an affiliate link to the pan I used to make the cake. These are amazing! I’ve made them 3 times. They do taste like caramel! I made this and it is amazing!! I love all of the recipes that have tried. Probably 6 or 7. The amount of filling ingredients does not seem to enough to create what is pictured. Is there something missing? Hi Kathleen. It’s a really tiny cake :) Only 4″ in diameter, hence the small amount of filling required. There’s 15+ tbsp of substance in the filling, which is equivalent to just under 1 cup (16 tbsp) + the raspberries on top. If you want to size the recipe up to a larger size, you can see the downloadable raw cake multiplication helper beneath the recipe. This looks perfect, and makeable! Can I use already frozen raspberries or would they not work? Hi Jenny. You could use them, but they might not look as nice visually (I find they’re often clumped up or smooshed when frozen). Another option is to thaw them out a little and mash them up with a hint of maple syrup (or plain) and spread that on top of the cake. I’d probably do the latter if all I had was frozen raspberries on hand.